P.O. Box 1943, Sharjah, U.A.E. National Plastics produces a range of acoustic pipes suitable for above ground drainage systems that have been certified by the German Fraunhofer Institute IBP according to EN 14366. The pipes are made from a special acoustic grade virgin uPVC material and consist of sizes from 40mm (1 1/4") upto 160mm (6"). Larger sizes are available on request. The pipes are metric/ISO dimensions (See Table 1) and fully compatible with the "Redi" Phono Line range of acoustic fittings. The drain pipes meet and exceed all the performance requirements of EN1329 (UPVC above ground drainage systems. 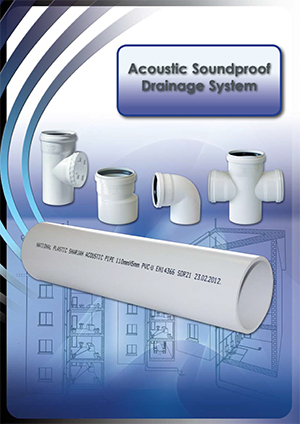 For the full details on our Acoustic Soundproof Drainage Systems range please download our catalogue or browse through our full range of Catalogues that are available for download. © 2019 National Plastic. All rights reserved.